Comments: Bossk, a Trandoshan, began his career during the Clone Wars by hunting Wookiees in the Kashyyyk system. 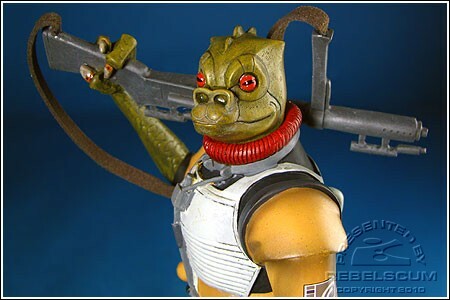 During this time, Bossk made a name for himself and began accepting bounties on non-Wookiees as well, becoming one of the galaxy's most feared bounty hunters. This piece was available for sale during Celebration V, August 12-15, 2010.